Orthotics are valuable tools in the field of podiatry. They can be used for both short and long-term care of certain medical issues. Even better, there are instances where orthotics can help you avoid problems down the road and recover from an injury in less time than you otherwise would. When the common injuries that cause heel pain are left untreated for 30+ years—something that happens all too often when people ignore foot pain or think it’s not a big deal—there is a 40-50% chance surgery will be needed to correct the problem. If we can get you set up with a pair of orthotics now, however, that risk drops to a 5% chance of surgery. Custom orthotic devices are some of the best tools we have to help you overcome heel pain – and other foot and ankle conditions as well. 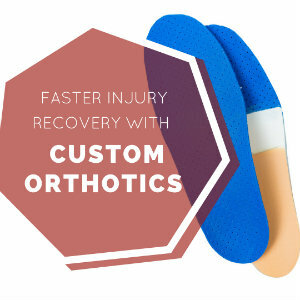 Orthotics are customized shoe inserts prepared to work with your unique feet and address some kind of medical issue you are experiencing. They are different than the inserts you can buy over-the-counter at stores and nationwide pharmacy chains. Those inserts may be able to provide some addition conditioning or arch support, but they are not intended to treat a medical condition. What orthotics do to help heel pain is reposition the foot and restrict abnormal biomechanical motion. Our patients are quite familiar with the idea that we can either “change the foot or change the environment.” Changing the foot is to use surgery to correct a problem. Now, when external methods—like orthotic devices—are used to control a problem, it doesn’t actually make the root cause go away. The symptoms will be addressed, but just like taking off a pair of eyeglasses, they will come back if you stop using them. With that being said, a pair of orthotics used for a developing foot can actually make permanent changes. This can happen until around age 12 for girls and 13 for boys. The most common source of heel pain, by far, is plantar fasciitis. Orthotics can address the problem by restricting the motion that caused repetitive pulling on the plantar fascia (a band of tissue connecting the bottom of the heel to the bottom of the forefoot). This frequently happens with overuse during intense physical activities. Whereas orthotics can be used to treat heel pain, we may or not prescribe a pair for you depending on various factors. There are certainly instances wherein other treatment methods are successful at addressing the problem. In some cases, the test we conduct before prescribing orthotics shows they will not be effective for you. The bottom line is that we are not going to prescribe them to you if you don’t need them or they won’t work. If you are suffering from heel pain, don’t ignore it or wait for it to go away on its own. Instead, come in and see us here at our Richardson, TX office. Call us at (972) 690-5374 and our staff will be glad to answer any questions or help you set up an appointment.